Typography is one area of web development that has seen painfully little advancement when compared with other areas of the industry. 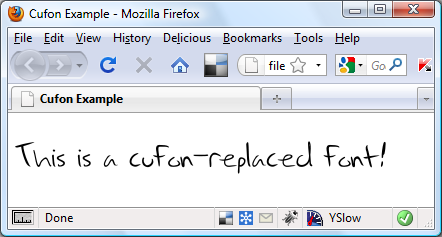 Web developers have been forced to rely on a small set of ‘web safe’ fonts that are likely to be installed on the majority of their visitor’s computers. Image and flash-based solutions have arisen, both of which have downsides to using. Thanks a lot. I learned how to use cufon funtion now. I also learned to add the textshadow code after cufon.replace function. There are also color: ‘-linear-gradient(#, #) function.